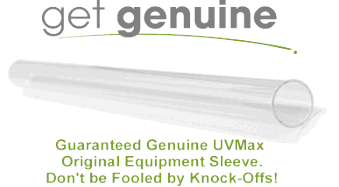 We are pleased to offer a complete selection of replacement sleeves for all Trojan UV ultraviolet (UV) sterilizers. Viqua (Trojan) UVMax replacement sleeves are designed only for use in Viqua (Trojan) UVMax UV sterilizers. We do not recommend that you attempt to use Trojan replacement sleeves in models made by other manufacturers.